As if belonging to the YMCA doesn’t make me happy enough, my local Y has started a book exchange program (a well-intentioned, pile, rather) in its lobby. Members donate books they’re done with to the pile and the donated books become fair game for anyone who’s interested. On my way in and out, I stop to scan the boxes and bags and bins of books for new finds. The selection is delightfully varied and makes me love my fellow members even more, quirky smarty pantses that they are. Recently, I made quite the haul when I lifted a few tattered textbooks to find six (SIX!) Peter Mayle books peeking out from underneath the castoffs like rays of Mediterranean sun. “Bring us home!,” they said, “love us and read us and dream of meals in Provence with us!” Um, OKAY GUYS! It’s cliché to be an escapist American or Brit who loves to read Peter Mayle, but I’m an American who loves to read Peter Mayle. I really, really do. His books fill the mind with Provençal scents and smells and breezes and dreams of sunny, lazy lunches soaked in wine and olive oil that are much cheaper to read about than to create (faster, too). A Year In Provence and Encore Provence are favorites of mine, as is A Good Year, which Ridley Scott made into a Russell Crowe-starring movie in 2006. Also cliché: women who love Russell Crowe movies. I don’t want to, I try not to, there’s nothing interesting or noble in doing so… but my heart can’t be swayed. He was wonderful in A Good Year, as was lovely Marion Cotillard. Such pretty people in such a pretty setting. Who wouldn’t want to watch that? Speaking of the pretty setting, let’s take a look at the grounds of Château la Canorgue, where the movie was filmed. Le sigh. Grab two bowls. In one, mix the drained tuna, the chopped capers, 3 tablespoons olive oil, the vinegar, and about 1/4 tsp black pepper. In the other bowl, toss the sliced fennel, the chopped parsley, 2 tablespoons olive oil, a large pinch kosher salt and another 1/4 tsp pepper. 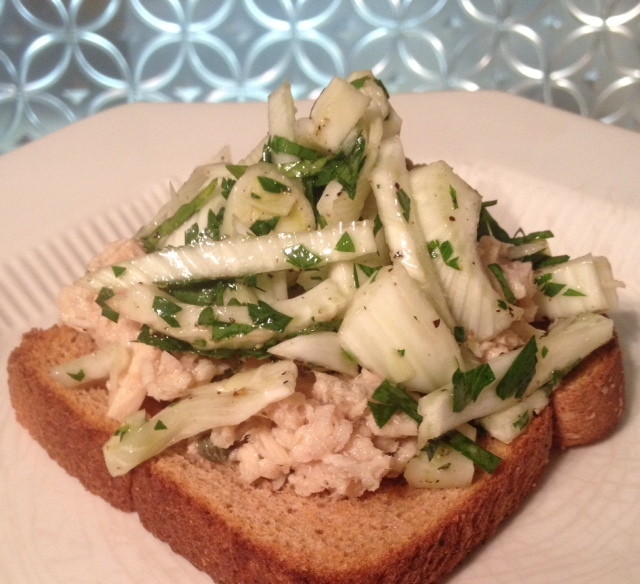 Spread a bit of the tuna salad on toast, then top with fennel salad. Grab your loved one and whisper a sweet nothing into his or her ear. Bonus points if you whisper it en français. I may be getting carried away by Max & Fanny’s love story, but this post is dedicated to my husband and how he makes every day feel like a day in Provence. This entry was posted in Classics, Easy, Fast, Fish & Shellfish, Healthy Spin, Pescatarian, Quickie, Snack, Travel, Uncategorized and tagged mediterranean tuna salad, no cook recipe, no cook tuna recipe, open faced tuna sandwich, provencal recipes, tuna and fennel salad. Bookmark the permalink. Love Peter Mayle! Read him extensively before we stayed in Lourmarin (where he lived) in Provence a few years ago. Alas, no Mayle sightings. I also recommend his Provence A-Z: A Francophile’s Essential Handbook-funny and educational. We will try the tuna recipe and fondly reminisce of our time in that glorious area. Amazing!! I want to hear all about your time in Provence! !